View/Sys/Gal: Ode " Comments" in "Classic." This gallery contains various classic systems that were used to test OdeFactory. It is an older gallery that was updated 4/4/17. The Duffing and Lotka-Volterra systems date back to 1918 and 1910 respectively. They both grew out of ode models of physical systems and they both have an extensive literature. The other systems are predominately nonautonomous and from contemporary ode textbooks as opposed to dynamical systems textbooks. The older ode textbook emphasis was generally on non-computer based math analysis. The "solutions" discussed in this gallery are computer based. View/Sys/Gal: IMap "2D linear system" in "Classic." Image 1: Ode view with colored V fld nullclines and trajectories. Image 2: IMap view with orbits. View/Sys/Gal: Ode "Duffing oscillator" in "Classic." This is one of the various forms of the Duffing oscillator system. 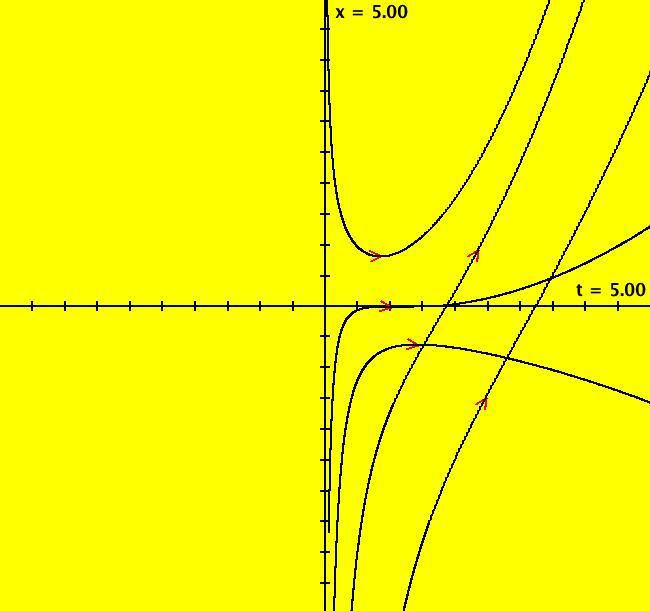 Image 1: The solution curve for ICs (t,x,y) = 0,0,0). 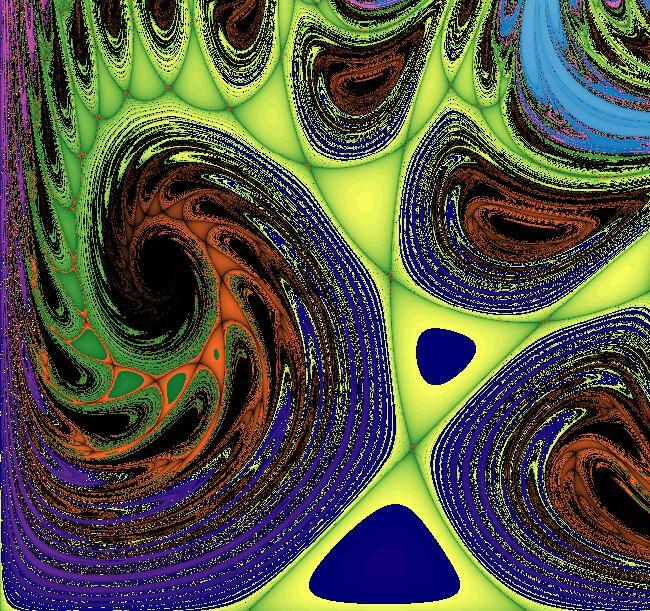 See: "Numerical Solution of Differential Equations" by Isaac Fried, 1979, p. 221, ex 10. 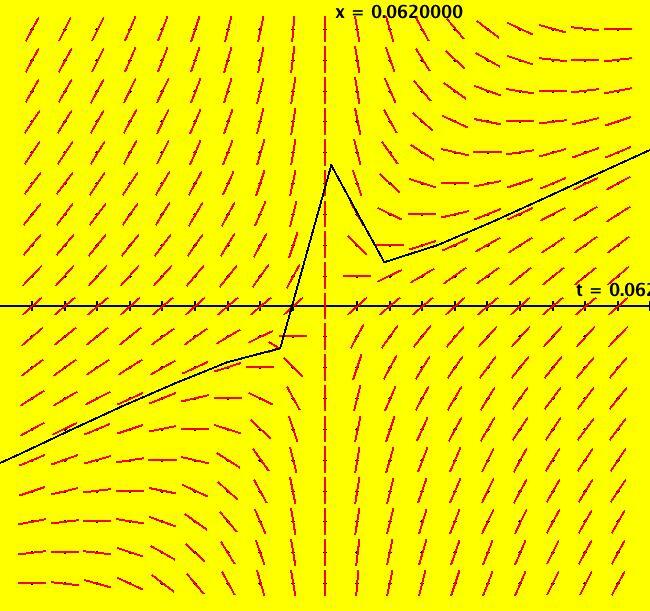 View/Sys/Gal: EMap "Duffing oscillator, 2D nonautonomous" in "Classic." This is a 2D nonautonomous system. 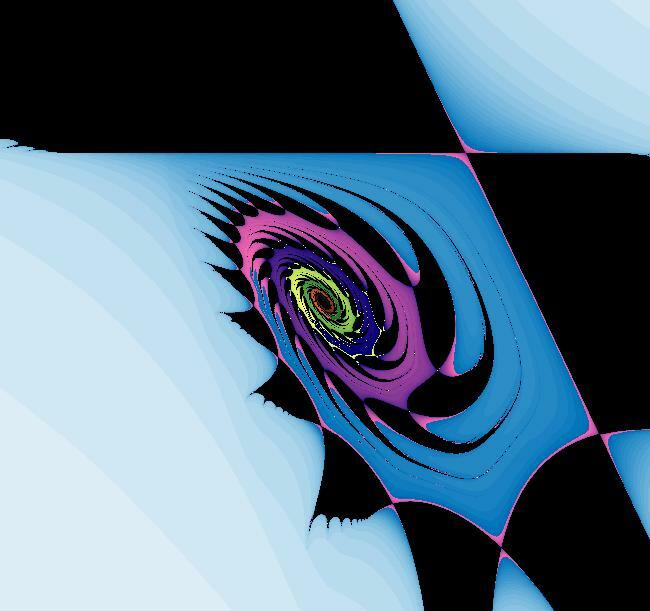 Image 1: Ode 3D/(t,x,y) view. Image 2: Ode 3D/(x,y) PMap view with k = 1; b = .2; a = .3; c = 1. The ICs are (x,y) = (0,0) and t-final is about 3000. The orbit is chaotic. 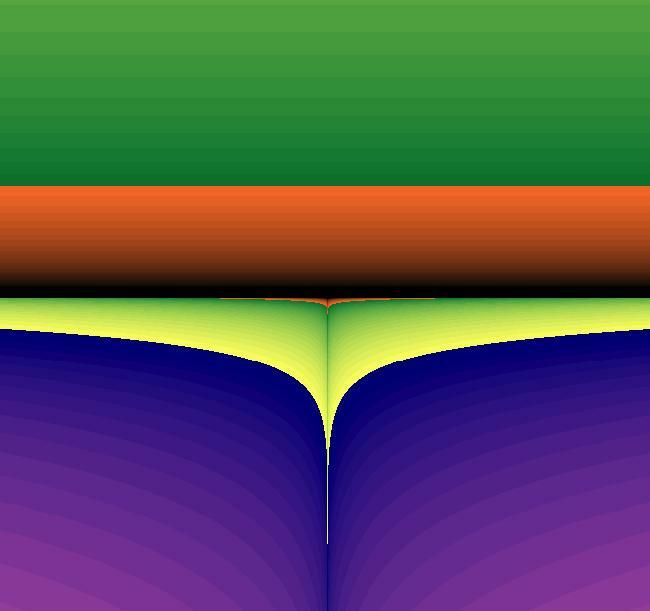 Image 3: IMap view for k = 1.7, b = .13, a = .22, c = .59. 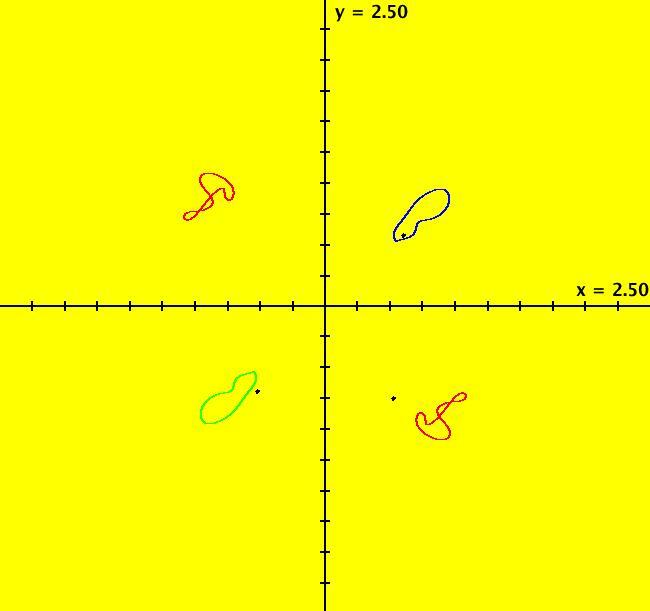 There are three attractors: one in quadrants 1 (blue), one in quadrant 3 (green) and one 2-part attractor (red) in quadrants 2 and 4. Image 4: EMap view. Prisoner set is black. There is an extensive literature regarding the Duffing equation. You might want to start here. View/Sys/Gal: Ode "Duffing oscillator, 3D autonomous" in "Classic." You can always convert a nonautonomous system to an equivalent autonomous system in a phase space of one additional dimension. Starting with the previous 2D nonautonomous system, t was replaced by z and dz/dt = 1 was added to get this equivalent 3D autonomous system. 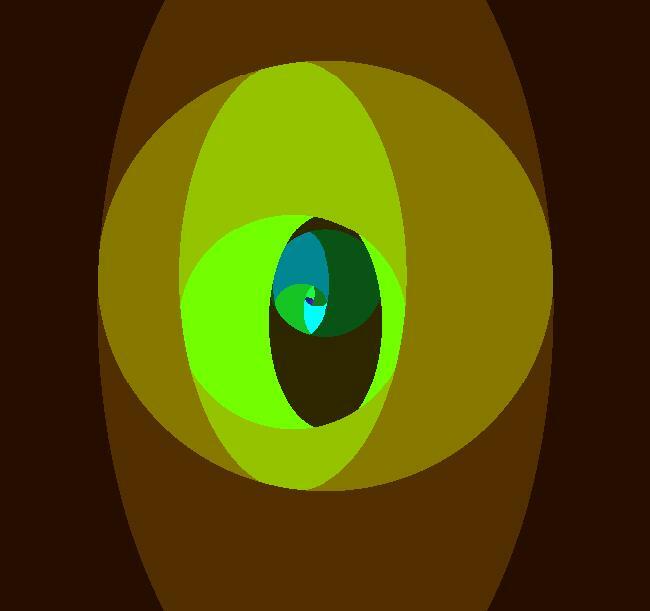 View/Sys/Gal: Ode "Lotka-Volterra equations" in "Classic." The parameters are all positive and the physical region is the 1st quadrant. It takes 50 minutes but Mattuck proves that the fixed point is a stable center. to see the contour curves discussed by Prof. Mattuck. In OdeFactory click the Flow button to see the flow in the phase space. 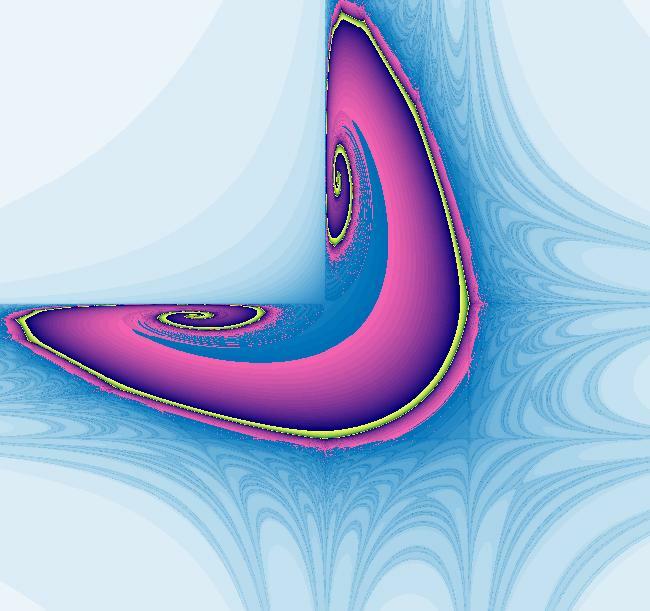 View/Sys/Gal: EMap "Lotka-Volterra equations as an EMapCT3" in "Classic." Some "art" image examples follow. The images are interesting EMap views of the Lotka-Volterra system created by varying parameters, axis limits and color tables. 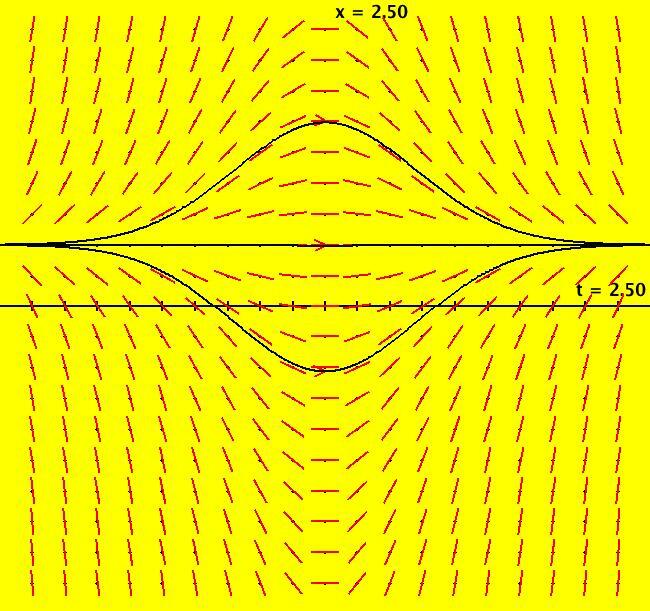 View/Sys/Gal: EMap "Lotka-Volterra equations as an EMapCT3 ver 2" in "Classic." Image 1: Another EMap image. 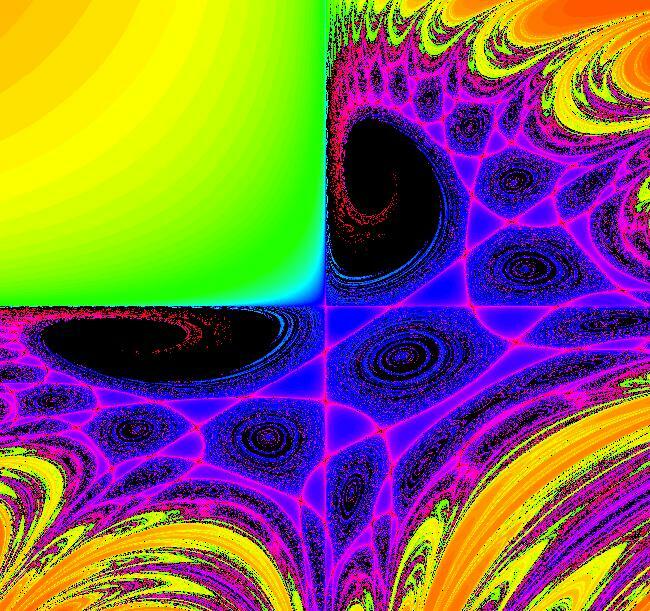 View/Sys/Gal: EMap "Lotka-Volterra equations as an EMapCT3 ver 3" in "Classic." View/Sys/Gal: EMap "Lotka-Volterra equations, time scaled as EMap" in "Classic." Image 1: Parameter s scales time. View/Sys/Gal: EMap "Lotka-Volterra equations, time scaled as EMapCT3" in "Classic." Image 1: A final EMap image. View/Sys/Gal: Ode "p. 60, Example 2, from KKO" in "Classic." 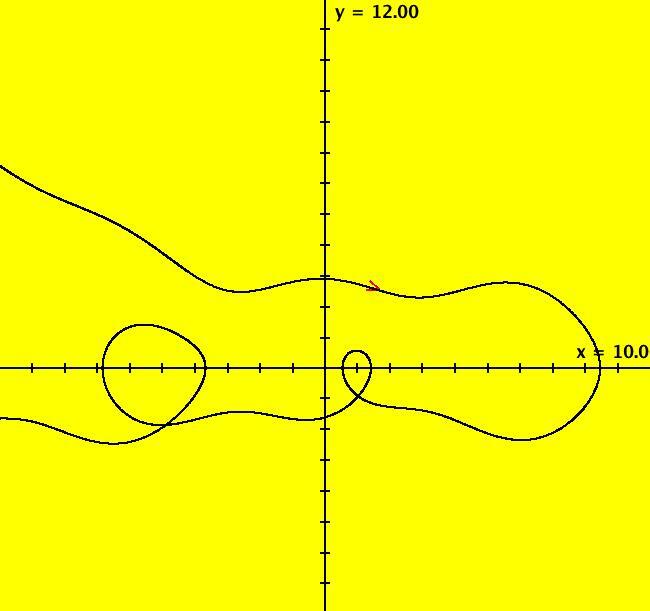 in the (x,y) coordinate system. Image 1: Three solution curves. All solutions go to x = 1/2 as t gets large. 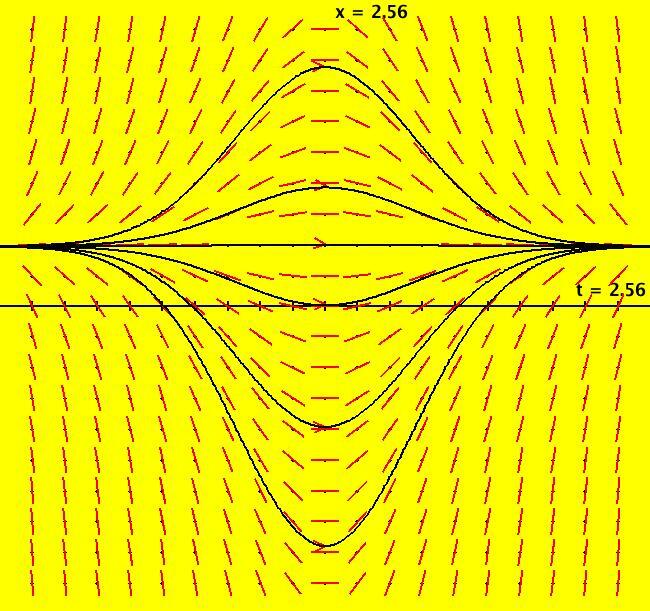 All solutions are also symmetric about the t axis. View/Sys/Gal: Ode "p. 60, Example, from KKO, using fns P and Q" in "Classic." NOTE: User defined functions must always be defined in (t,x,y,z,w) coordinates. 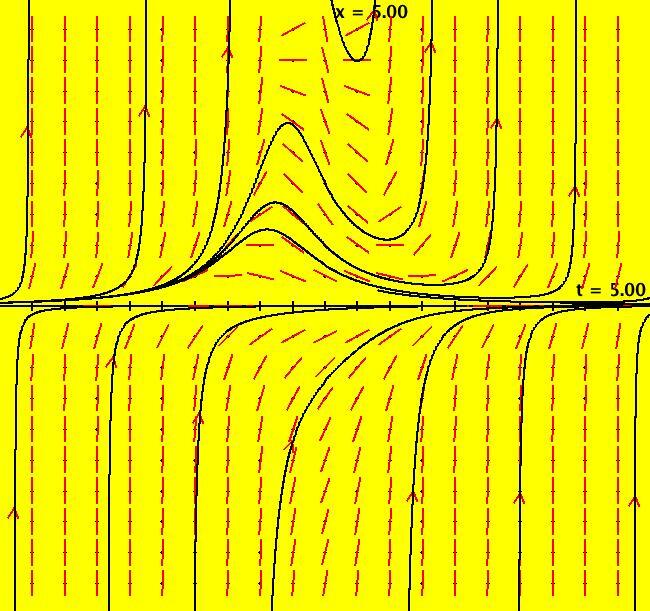 Image 1: Some solution curves. 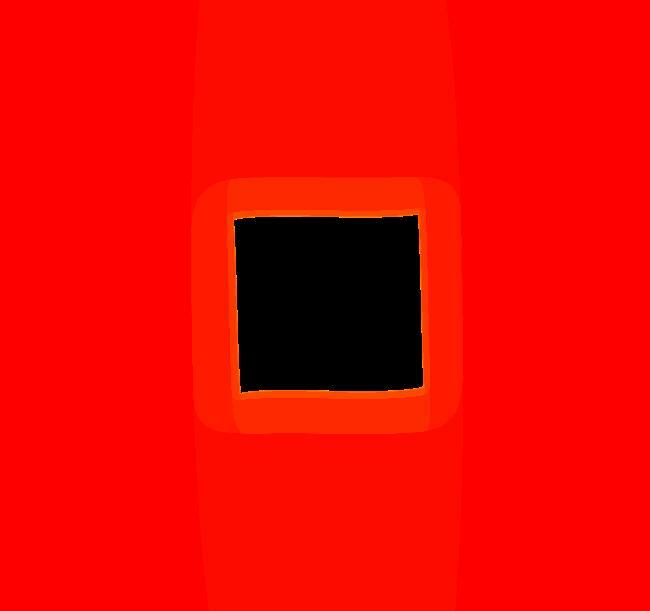 View/Sys/Gal: Ode "p. 61, eqn (2-20), from KKO" in "Classic." 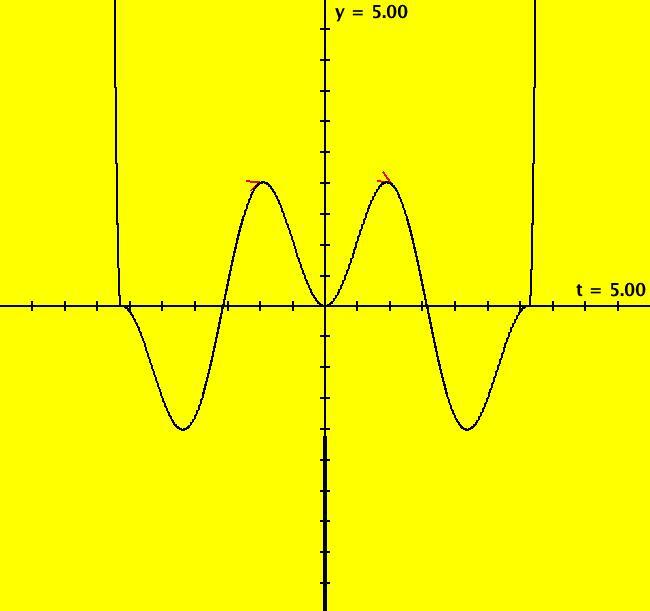 x(t) = -c/t+t/2 for t < 0. Zoom in to see what is happening near (0,0). Image 2: Image 1 zoomed in. View/Sys/Gal: Ode "p. 62, eqn (2-23), from KKO" in "Classic." It is nonlinear for all n other than 0 and 1. View/Sys/Gal: Ode "p. 64, ex 33, Riccati eqn, from KKO" in "Classic." 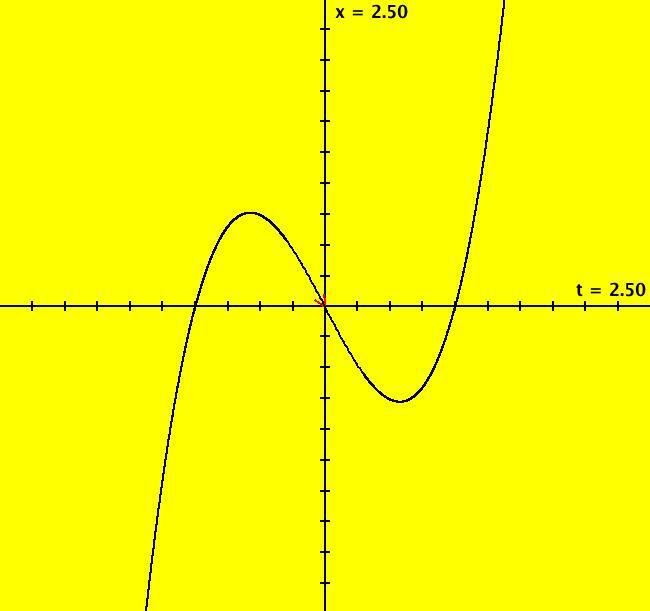 Image 1: Representative solution curves. View/Sys/Gal: Ode "p. 84, eqn (2-52), from KKO" in "Classic." 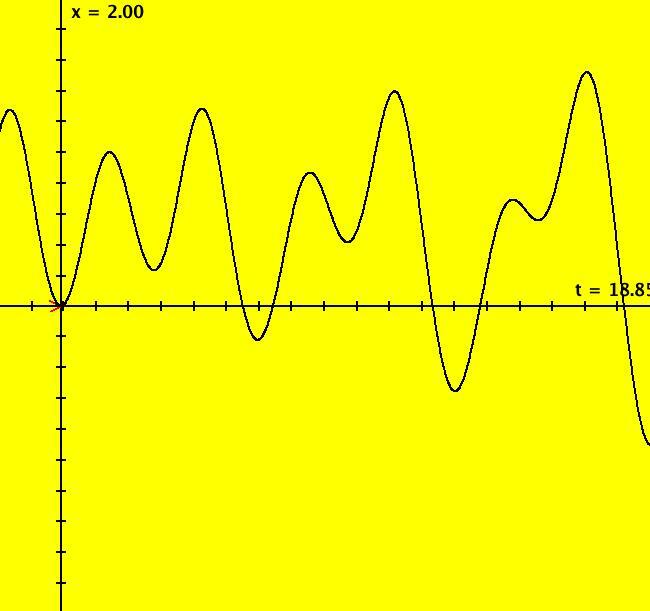 Since tan(0) = 0, the 2D system is not defined at t = 0. 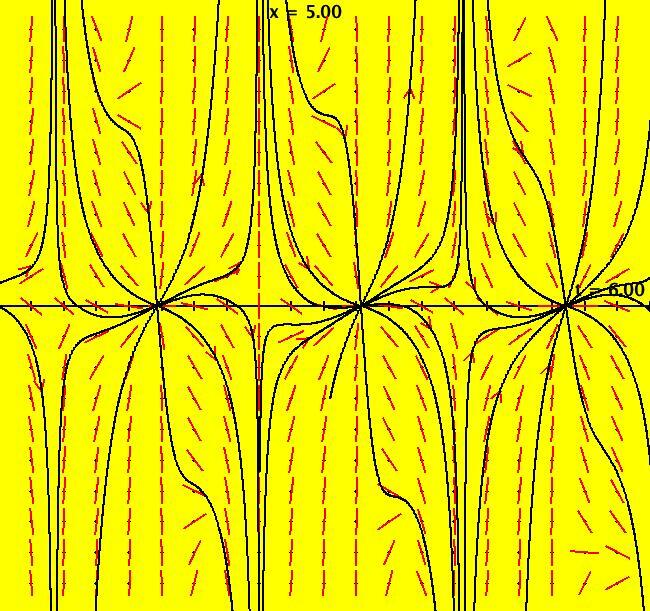 Image 1: Solution curves in the (t,x) plain with ICs (t,x,y) = (1,1,2) and (-1,1,2). 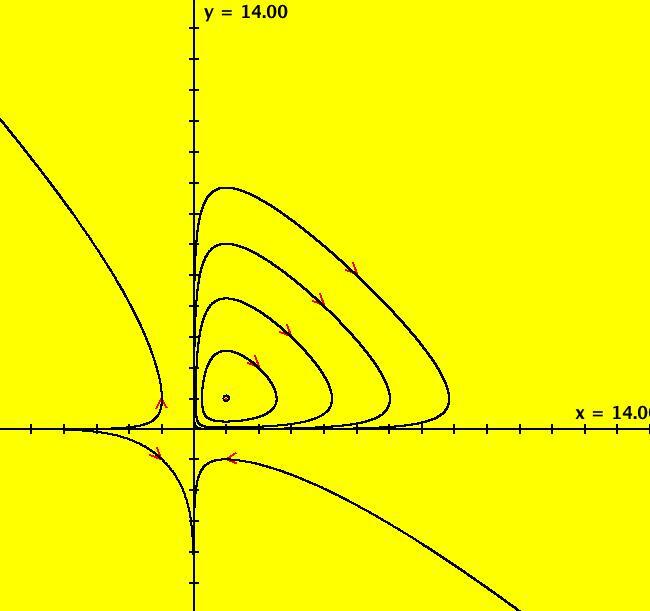 Image 2: Solution curves in the (t,y) plain with ICs (t,x,y) = (1,1,2) and (-1,1,2). View/Sys/Gal: Ode "two species competing for the same prey" in "Classic." (0,2), (.5,.5), (1,0) and (0,0). Image 1: Trajectories in the R2+ view. View/Sys/Gal: EMap "two species competing for the same prey, EMapCT3 view" in "Classic." Image 1: An EMap art image. 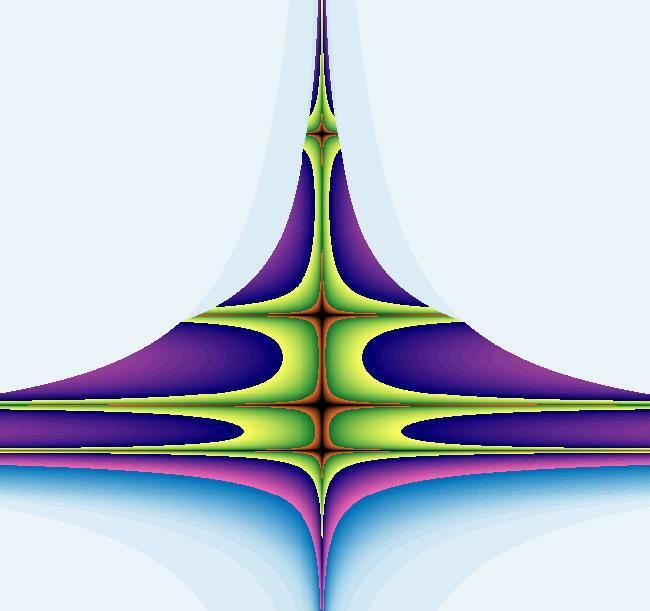 View/Sys/Gal: Ode "y'' = (2*y + ln(x))/x^2" in "Classic." The 2D system is not defined at t = 0 and the 2nd order ode is not defined at x = 0. 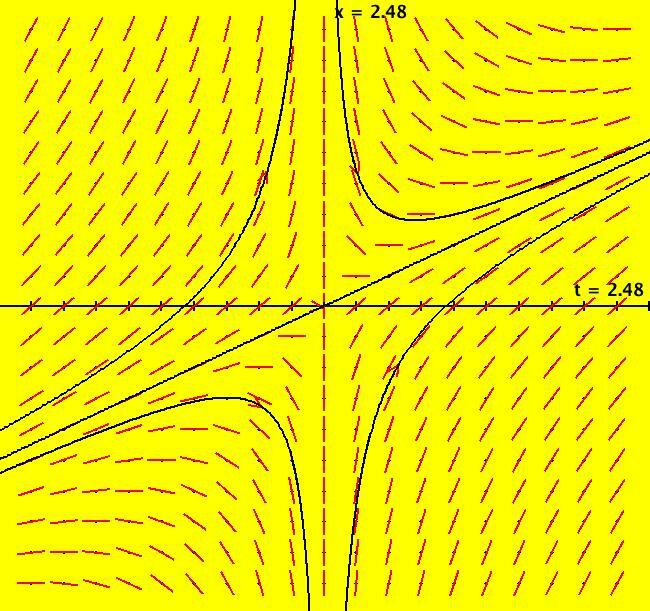 The solution curves in the (t,x) plain can cross because the system is nonautonomous. 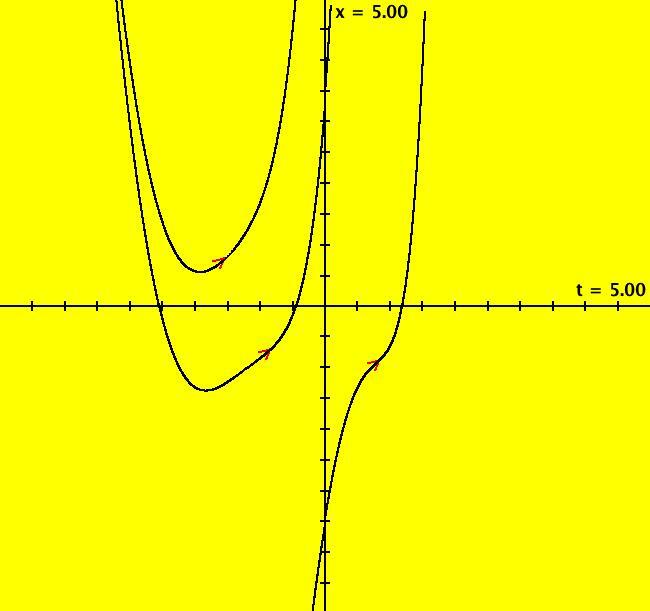 Image 1: Some x(t) solution curves. View/Sys/Gal: IMap "y'' = -sin(y)-b*y'+a*cos(c*x)" in "Classic." 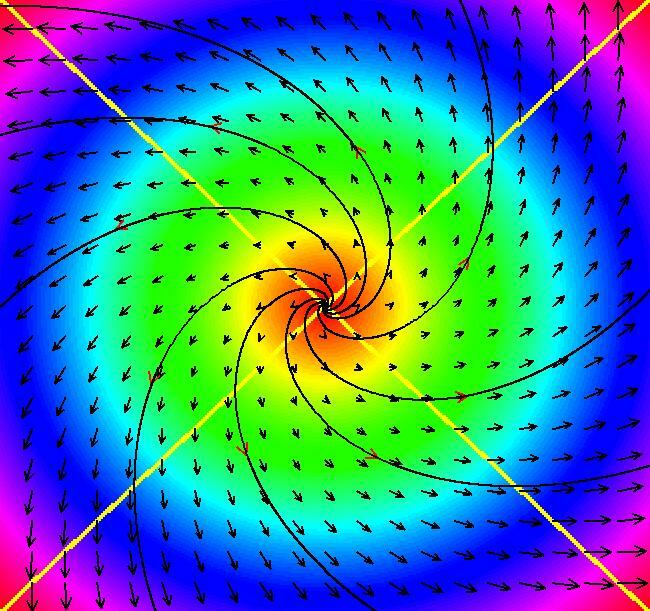 Image 2: IMap view with blue attractor about (0,0). View/Sys/Gal: Ode "y'' = 12*x" in "Classic." This example comes from "Differential Equations," by Kaj L. Nielsen, p. 23.
which is easy enough to show. 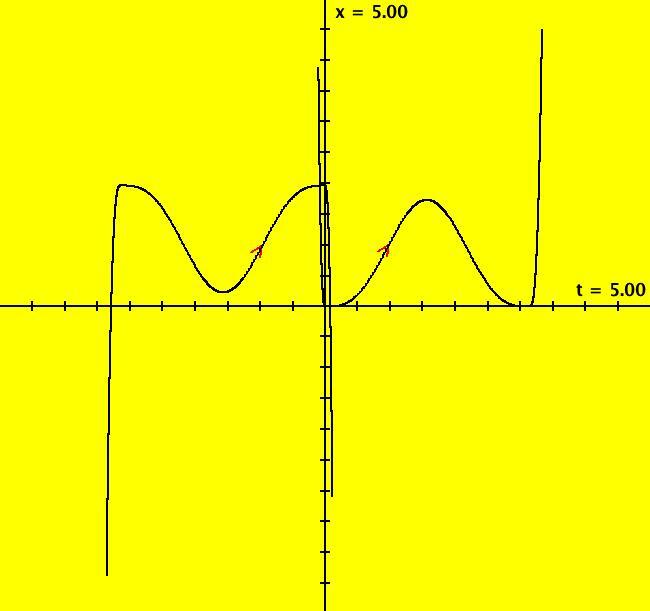 We see that x(t) = 0 at t = -1, 0, 1 and y(t) = 0 at t = sqrt(1/3) = +-0.577. We can plot x vs t and y vs t to verify the solutions. 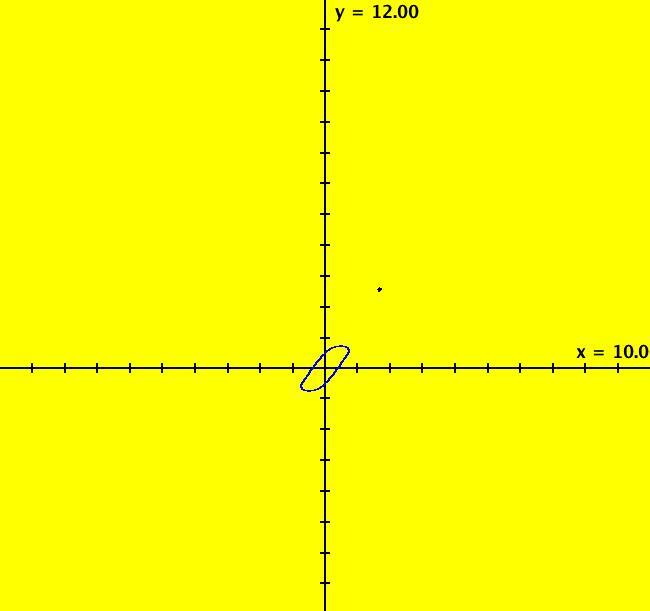 To see that y(t) crosses the t axis at 0.577, click on the crossing point. View/Sys/Gal: EMap "y'' = x+k*y, k = -2" in "Classic." Image 2: EMap view with CT2. 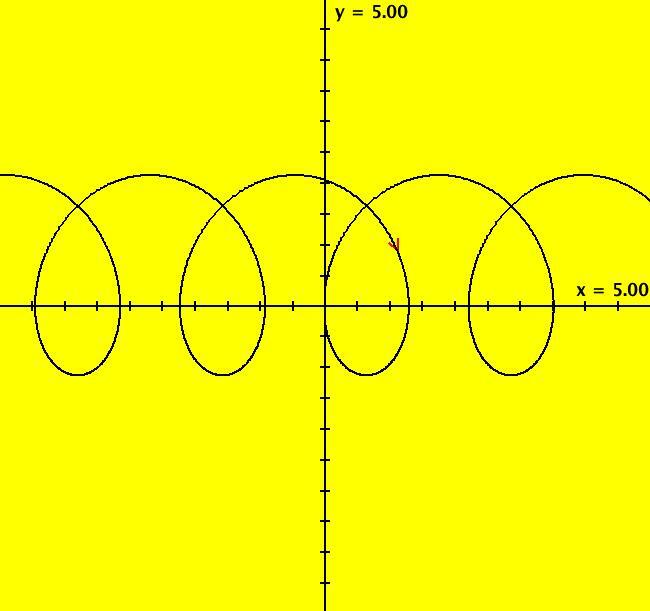 View/Sys/Gal: Ode "y''' = 2*y'' - y' + 2*y +4*x +5*e^(2*x) + 20*cos(x)" in "Classic." 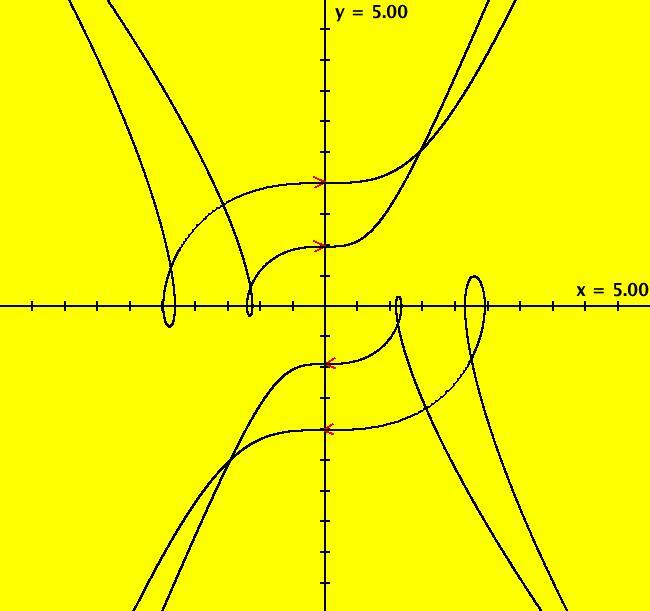 in the (t,x,y,z) coordinate system. 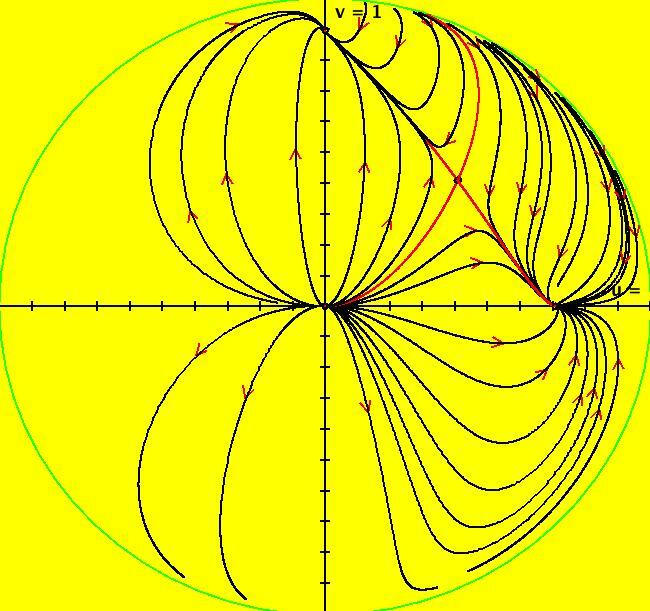 in the (x,y,y',y'') coordinate system. 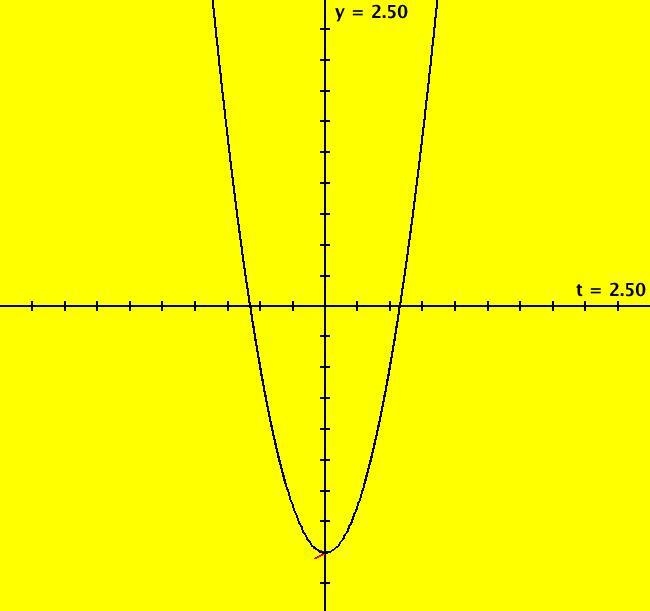 Image 1: x(1) for y = 2. View/Sys/Gal: Ode "y'''' = a*y''' +b*y'' + c*y' + d*y" in "Classic." 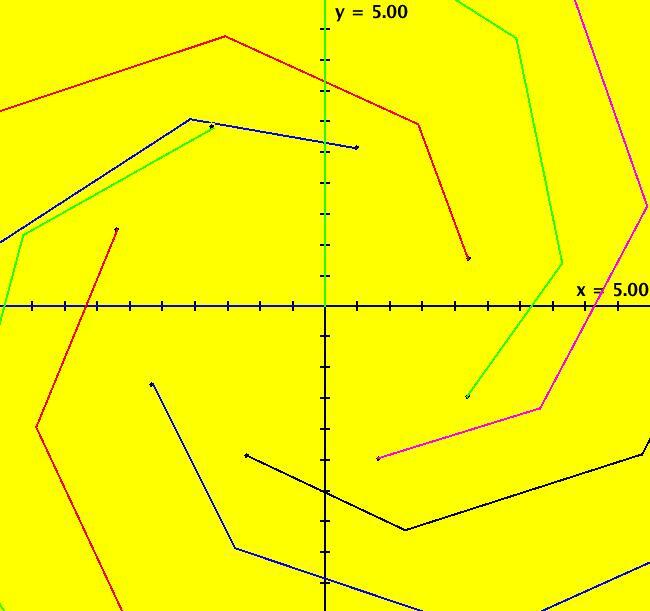 in the (t,x,y,z,w) coordinate system. 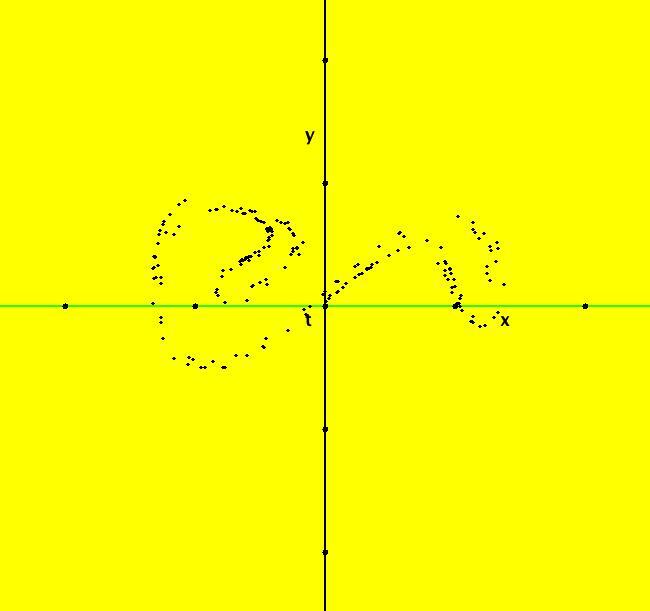 in the (x,y,y',y'',y''') coordinate system. 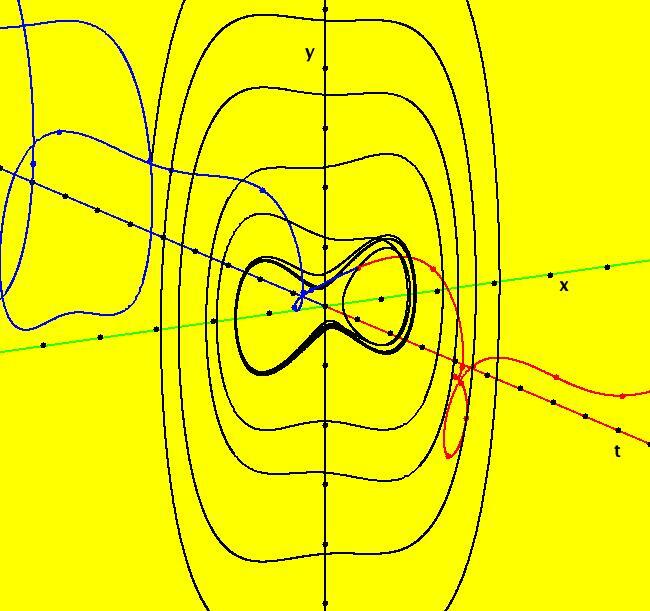 Image 1: Trajectories in the (x.y) plain for (z,w) = (0,0).